Info: This disturbing legacy is known to the cabal through the Daimonomicon found in Drake's Hoard which teaches both its Attainments, its knowledge and its beliefs. According to this text the legacy was created by a 13th-century Mastigos who took the name ''Tochel'', and their teachings seem to be an interesting combination of Aztec and Atlantean lore. Members of the Black Sun Cult believe that the mortal world is warped and corrupt by design — a misbegotten, chaos-laced creation built by hubristic, degenerate gods. In these mages’ eyes, perversion is implicit in the design of every earthly object and inhabitant. A paradise once existed, they argue, and it was torn apart to provide the base material for the ruinous human world. This paradise is identified with 'Tamoanchan', the mythical Aztec world of Itzpapalotl, the great and terrible Obsidian Butterfly. The only survivors of its destruction are the demonic Tzitzimime, distorted spirits of vengeance bent on the annihilation of Earth. Trapped in the sky and hidden by the sun, they await the day of unending eclipse when they will drop to Earth and visit the righteous fury of their forgotten world on all of humanity. The Dreamers often communicate with spirits they identify as Tzitzimime, hearing their whispers from the rippling chaos which may or may not be Pandemonium. To empower the agents of Tamoanchan and better receive their guidance (or even encourage their manifestation in the mortal world), the mages of the Black Sun Cult work to provide sacrifice on a grand scale, sabotaging structures and grand events in an effort to murder dozens or hundreds of souls at once. These sacrifices are ritually prepared and carried out so as to channel energy to the Tzitzimime, providing them with the strength to slip their bonds and come to Earth. Eventually, the Dreamers hope, the energy gathered will be sufficient to bring about the day of unending eclipse and end the pain of life. Black Sun magic makes use of the raw power of fear, ritually occluding conscious thought by immersing the practitioner in base terror and opening a conduit for the energies of Itzpapalotl to pass through. They call this “opening the bone passage,” a practice that puts considerable physical strain on the mage. To help stimulate the effect, Dreamers often subject themselves to threatening circumstances with little or no guarantee of survival, trusting their own power to preserve them. Many actually remain at the site of a planned sacrifice, allowing themselves to participate in the tragedy and risk becoming its victims. The heightening of fear that precedes the event often provides them with enough power to survive once it begins — but not always. 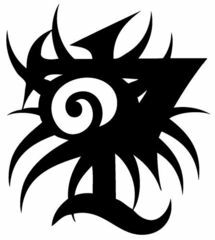 Every member of the Legacy is encouraged by the tome to dedicate themselves to one specific Tzitzimitl-demon of their choosing, working to energize their patron with regular ritual sacrifice. Some have specific dates or locations reserved for their activities, and will practice their works on a set schedule.